Shadwell Stable’s Mohaymen (#14) and Reddam Racing LLC’s reigning 2-year-old champion Nyquist (#16) – a pair of unbeaten stars scheduled for a pre-Kentucky Derby showdown in Saturday’s $1 million Florida Derby (GI) at Gulfstream Park – loom as the top wagering choices for Churchill Downs Racetrack’s April 1-3 fourth and final pool of the 2016 Kentucky Derby Future Wager. After the race on Saturday, we will see who stays on top as the favorite. Churchill Downs odds maker Mike Battaglia has installed Mohaymen, winner of Gulfstream’s Fountain of Youth (GII) for trainer Kiaran McLaughlin, as the solid 7-2 favorite among 24 wagering interests in his morning line odds. Nyquist, the Doug O’Neill-trained winner of last fall’s $2 million Sentient Jet Breeders’ Cup Juvenile (GI) at Keeneland and Santa Anita’s San Vicente (GII) in his only previous start of 2016, is the only other Pool 4 betting interest with single-digit odds. Next in the KDFW Pool 4 morning line is the always-popular Mutuel Field (#24, 10-1), which includes all 3-year-olds other than 23 individual horses listed among the pool’s 24 betting interests. Also listed at 10-1 is Rebel (GII) winner Cupid (#4), half of a Bob Baffert-trained Future Wager duo that also includes Los Alamitos Futurity (GI) and Robert B. Lewis (GIII) winner Mor Spirit (#15, 12-1). Other well-regarded hopes include Tampa Bay Derby (GII) winner Destin (#7, 12-1), San Felipe (GII) winner Danzing Candy (#5, 12-1), Louisiana Derby (GII) winner Gun Runner (#10, 15-1) and Lecomte (GIII) winner Mo Tom (#13, 15-1). 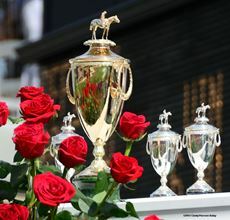 The Future Wager, a Kentucky Derby tradition launched by Churchill Downs in 1999, enables fans of the Kentucky Derby to wager on contenders for its 2016 running well in advance of the race at odds that could be much more attractive than those available on Derby Day. Each Kentucky Derby Future Wager pool permits $2 minimum win bets and $2 exacta wagers, with the latter also available in $1 minimum increments in boxes and other multiple number configurations. Betting on Pool 4 of the Kentucky Derby Future Wager is set to begin at noon (all times EDT) on Friday and conclude through Sunday, April 3 at 6 p.m. The 2016 renewal of the Kentucky Derby is set for Saturday, May 7. Winning payouts from this week’s fourth Future Wager pool will be based on the odds in place when betting in the pool concludes on Sunday. The 23 individual betting interests in Pool 4 include eight horses that were not part of the Pool 3 wagering menu: American Pioneer (#1, 50-1), Cherry Wine (#2, 20-1), Creator (#3, 30-1), Dazzling Gem (#6, 50-1), Flexibility (#9, 50-1), the Japan-based UAE Derby (GI) winner Lani (#11, 50-1), Tampa Bay Derby runner-up Outwork (#17, 30-1) and Louisiana Derby runner-up Tom’s Ready (#21, 20-1). Cherry Wine and Tom’s Ready were included in earlier pools, but were not part of the KDFW Pool 3 menu. Todd Pletcher, who saddled WinStar Farm’s Super Saver to win the 2010 Kentucky Derby, trains a trio of Pool 4 betting interests in Destin, Outwork and Fountain of Youth runner-up Zulu (#23, 30-1). Baffert, Chad Brown (#9 Flexibility, 50-1 and #18 Shagaf, 30-1) and Steve Asmussen (Gun Runner and #3 Creator, 30-1) each train two of the pool’s individual horses. This is an edited press release.